There are iconic people of global proportions whose lives are able to reach far outside of themselves and the countries in which they are from. Names such as Martin Luther King Jr., Mother Teresa, and Mahatma Gandhi are a few of the people that come to mind when we think of such icons. Another name that is on that list is that of one Nelson Mandela. 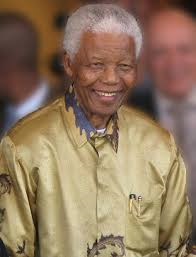 Nelson Mandela or Madiba as he is affectionately known has passed away today at the age of 95 years old at his home in Johannesburg. He had returned home on September 1 in a critical condition after being in a Pretoria hospital for almost three months - the fourth time he had been admitted to hospital since December. He had battled a series of lung infections and respiratory illnesses in the past few years. Mandela is a true humanity icon and his presence will surely be missed. God has acquired a true warrior spirit. My heart is truly heavy with this news, but I truly thank God for the life of Madiba. Rest in peace mighty giant for yours was truly a job well done.